Hiking toe problems can sideline your ambitious hiking plans. Gravity, friction, pressure, and heat all take their toll on your toes. That's why you need the best tips for handling toe problems as a hiker. Lucky for your toes, you've found them right here! Ignoring hiking toe problems is not an option for a dedicated hiker with ambitious mileage plans. But there's a small problem. Those long suffering little digits on the end of your feet have a very limited vocabulary to capture your attention. No big voice, like a pulled muscle or sprained ankle. What tales are your toes telling? None of this is medical advice. Use your own good judgment and visit your health care professional for good foot care. Hiking For Her recommends smart strategies and good foot care products for you right here. It’s normal to have slightly swollen fingers, toes and ankles after a long hike. However, it’s not normal to have one or two toes which are more swollen than the others. When this happens, your job is to figure out what those tender toes endured, and then fix it. Maybe there was more pressure on that toe from a poorly fitted new boot? Or an old boot got wet on your last hike, and dried in a new configuration to create an unexpected pressure point? Could it be that your hiking sock layers got bunched up, creating extra pressure, heat and friction there? If one of the middle little doggies is swollen or bruised, is it possible that a lacing problem pressed heavily upon it? Is there something embedded under the toenail? or in the skin? Did you walk around at your lunch spot bare footed, and cut yourself? Whatever you do, don’t ignore a swollen toe. It's a red flare pointing you to a troublesome issue that needs to be dealt with promptly. 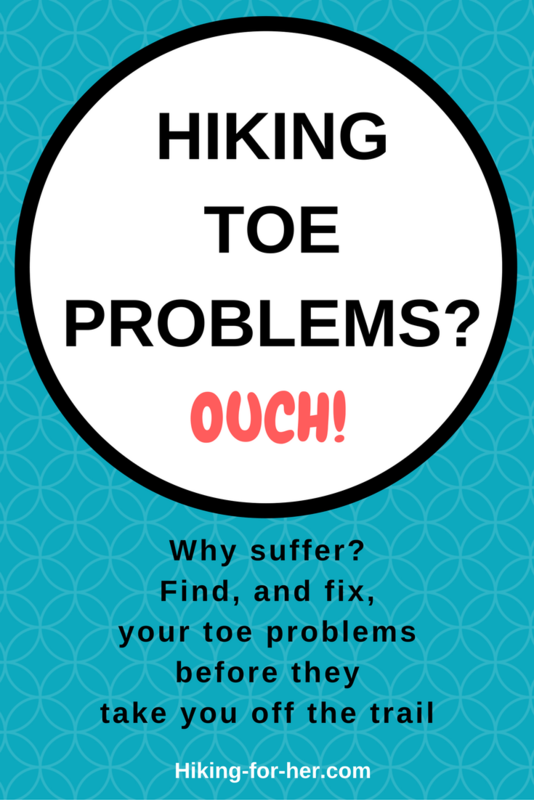 Why create even more hiking toe problems by the wishful thinking mantra "it'll go away"? If you have a blister by the end of a hike, it was created by the unavoidable triad of heat, friction and moisture. Jump all over a hot spot and eliminate as many factors in this triad as possible before you earn a painful blister. A blister on top of your toes means your socks rubbed against the skin with each step, or they were sliding across your boot and dragging your skin with it. Swap out your socks for anti-blister socks, like ArmaSkin. Blisters between the toes also can be a sock issue. Try breathable, wicking liner socks topped by thicker socks. Blisters on the sides of your feet, including your toes, are a trail footwear problem. There is too much pressure and friction on your skin at that particular location. Try new lacing strategies (keep reading), thinner socks, or moleskin on vulnerable areas to avoid these hiking toe problems. And be scrupulous about emptying out your footwear before and after (and even during) a hike - no troublesome trail debris should be trapped against your feet. Ever hear of WURU wool? It's New Zealand sheep's wool that you can wind around your toes to prevent blisters. 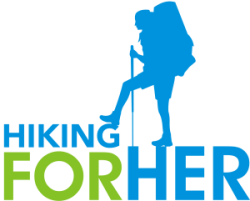 Read Hiking For Her's opinion of this anti blister approach here. Sometimes hiking toe problems like discomfort are normal. Your mission, should you choose to accept it, is to distinguish between pain and soreness. When you curl your toes, do you wince? Or is it more of a tender feeling? Toes that are sore in all three dimensions could be a normal “souvenir” of your hike. A toe with a distinctive pain pattern, on the other hand foot, is a big red arrow pointing to something that needs to be changed with your footwear. It can also indicate a bone problem or inflammation, which requires a visit to a podiatrist before you hike on it again. Take a close look at your toes, comparing the painful ones with non-painful companions on both feet. Athlete's foot, a fungal infection, will make your toes burn and itch, resulting in painful peeled and cracked skin. Get on top of this right away, to prevent the fungus from spreading to the rest of your foot, or between feet. Short, blunt cut toenails are the way to go for hikers. Make it a habit to trim your nails before every hike. Nails grow quickly enough to catch you by surprise between day hikes, or on a long backpacking trip. The color of a toenail can help determine the cause of the problem. A blackened toenail is a sign of bruising in the nail bed, caused by repeated trauma inside your trail footwear. 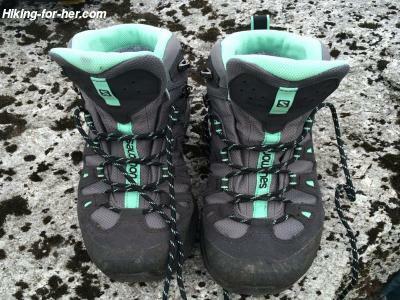 Example: Your toes bump against the front of the toe box as you descend a long, steep trail. Luckily, the nail will fall off on its own, and be replaced with a shiny new one. Losing and regrowing a nail will take a long time, and may prevent you from wearing sandals in public if you’re squeamish about the appearance of your feet. Long distance hikers consider lost toenails a perverse badge of honor! Wear yours with pride if the shoe or boot fits! Yellowed, cracked nails are signs of fungal infection (onychomycosis). Here are some photos of a full range of foot fungal infections, for your viewing pleasure. It will take some time to rid your nails of these invaders, and once you do, make sure you have a brand new pair of boots or trail shoes so you don’t re-infect yourself. It's also a great idea to disinfect your daily footwear, or replace it if possible. Don't try on used hiking boots without wearing your socks. You don't want to inherit onychomycosis! It will lead to big time hiking toe problems for you and your trail partners if you share gear. A callus is simply nature’s way of protecting the delicate underlying nerves and blood vessels from being damaged by repetitive forces. A hiker’s foot should develop these tough layers of skin at the contact points between skin and boot, usually on the bottoms of the toes and along the sides of the foot. The more you hike, the more pronounced these raised patches of skin will appear. You can smooth these calluses with a nifty little volcanic pumice stone. But go easy! You don’t want to eliminate these protective little bumps of dead skin completely. 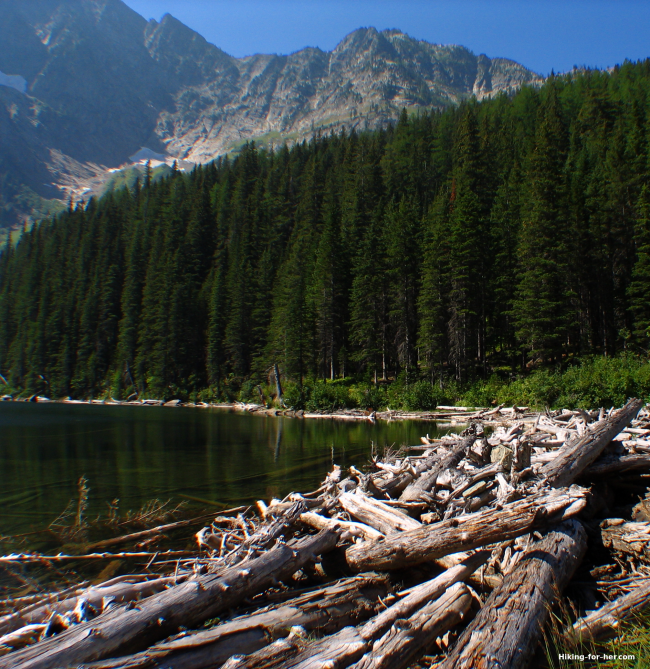 Bromodosis is the fancy word for the odor emanating from your well loved hiking boots. Blame it on the fact that you have more sweat glands in your feet than anywhere else. Plus gazillions of resident bacteria on your skin that love to eat up sweat molecules and then “burp” inside your boots. Food + microbial normal flora make a potent olfactory combination which culminates in sweaty boot syndrome. It's true that a certain amount of odor in your trail footwear is to be expected. But if it’s only your toes that smell weird, and smell A LOT, you need to rule out fungal infections. This is especially true if it's just the toe area of one foot that is odiferous, scaly and uncomfortable - even when you're not hiking. Scraping off some of your skin (it won't hurt!) and examining it under a microscope is the standard way to look for fungi, so get thee to a health care provider ASAP. A funky smelling backpacking tent or gear locker can also be blamed on these completely normal microbiological processes. Air them out, and never store wet gear for any length of time. If your toes are taking a beating on every hike, you need to spot -and fix- the problem. Which of these might be the issue? Your boots or trail shoes might not fit you properly – especially if they’re brand new. If you can't wait to get your boots off, that's a clue about fit! Back to the store they go! That’s why it makes sense to buy from reputable gear stores like REI an , with decent exchange policies. If your feet and toes hurt during, and after, your hike it's possible that you’re carrying too much weight for what you’re wearing on your feet. Consider more supportive footwear in a half size larger, so your foot bones can distribute the weight more easily. A switch to boots with sturdy arches, rather than trail shoes, can help. Read my review of this type of boots. Supportive, cushioning socks like these are also an idea to try. When your insoles wear out, your toes begin to bump against the front of your footwear because your heel is no longer in the right place. If the soles and uppers are still in good shape, just take out the old insoles and replace them. These inexpensive insoles can be cut to fit, so no worries if one foot is a different dimension than the other (a common hiking issue). Or purchase more expensive insoles, like these, for a longer lasting solution if your boots are new(ish) and you like the fit but have gotten a blister in them. Hiking toe problems could be a lacing problem in disguise. Experiment with new ways to hold your feet in place and prevent toe bumping. Give your feet some fresh air at least once during a hike. and encourages you to notice the tales your toes are telling! Plus it's a great excuse to put your feet up as you enjoy the hiking scenery you worked so hard to achieve. Bonus points for a nice relaxing foot soak at the lake shore. Ahhh! Banged up, callused hiking feet are just part of the fun of being a hiker. But you don't have to suffer with hiking toe problems. A little proactive strategy based on the best hiking toe problem busters can make your toes happy again! For more hiking self care strategies for happy trails, read this. Purchasing your hiking gear, clothing, and outdoor supplies through the links on this website means you pay nothing extra but Hiking For Her receives a small commission to keep the hiking tips flowing. Only the best of the best is recommended!